The International Criminal Court, The Hague. The Pentagon has reasserted its commitment to complying with the laws of war, after news emerged that the International Criminal Court is seeking an investigation into alleged war crimes by U.S. personnel in Afghanistan. Pentagon spokesman Mike Andrews, a lieutenant colonel in the Air Force, told VOA on Friday that the United States is "deeply committed to complying with the law of war, and we have a robust national system of investigation and accountability that more than meets international standards." Andrews was replying to a move by ICC Prosecutor Fatou Bensouda in November requesting judicial authorization to investigate the alleged misconduct by members of the U.S. military and Central Intelligence Agency. The alleged war crimes by U.S. personnel are centered on reports from secret detention facilities in Afghanistan and on the territory of other states who are party to the ICC, particularly between 2003 and 2004. 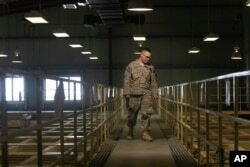 FILE - A U.S. military guard watches over detainee cells inside the Parwan detention facility near Bagram Air Field in Afghanistan, March 23, 2011. The Pentagon has denied operating secret jails in Afghanistan, although human rights groups and former detainees have described the facilities. U.S. military and other government officials confirmed that the detention centers exist but described them as temporary holding pens whose primary purpose is to gather intelligence. Andrews said the U.S. objects to such an investigation, specifying that "we do not believe that an International Criminal Court examination or investigation with respect the actions of U.S. personnel in Afghanistan is warranted or appropriate." Meanwhile, a defense official told VOA that the United States has never consented to be under the jurisdiction of the International Criminal Court, meaning it is not obligated to comply with the court's actions. "The U.S. has a longstanding and continuing objection in principal to any ICC assertion of jurisdiction over U.S. personnel," the official said. 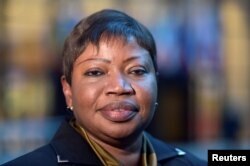 Bensouda, the ICC prosecutor, requested permission from the ICC judges on November 20 to investigate alleged war crimes and crimes against humanity in the ongoing armed conflict in Afghanistan. The court has been examining the situation in Afghanistan since 2006. The International Criminal Court began operations in 2002 and was designed to be permanent and independent of national governments as it investigated war crimes, crimes against humanity and genocide. While it has the support of small- and medium-power states, world powers such as the United States, Russia and China have been reluctant to sign on. The United States has specifically passed legislation prohibiting U.S. support of the ICC. Those laws authorize Washington to use "any means necessary" to repatriate U.S. citizens detained by the court. The U.S. also has diplomatic immunity agreements with some nations in which they agree not to turn U.S. citizens over to the ICC. The court is investigating situations in Burundi, the Central African Republic, Ivory Coast, Sudan, the Democratic Republic of Congo, Georgia, Kenya, Libya, Mali and Uganda. The ICC Office of the Prosecutor is conducting preliminary examinations in nine other situations: Afghanistan; Colombia; Gabon; Guinea; Iraq/the United Kingdom; Nigeria; Palestine; registered vessels of Comoros, Greece, and Cambodia; and Ukraine.